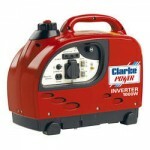 Clarke & Hyundai - Petrol Suitcase Type Generators. INCREDIBLY LOW PRICES On Clarke Generators and Hyundai Generators. Unfortunately Due To Complaints From Other Re-Sellers About Our Low Prices, We Have Been Forced To Remove The Prices Of Many Generators & The Buy Buttons From The Site. Please Therefore Call To Obtain The Lowest Price On The Clarke Generator Model You Require.